For a variety of reasons, vintage, or more accurately antiquated, photographic processes are making a comeback of sorts. VanDyke and Cyanotype are generally the two that people begin with, as I did because they are the most forgiving and least expensive. The Cyprus VanDyke Series comes from my time on the Pyla-Koutsopetria Archaeological project. Several days I stayed behind and walked the streets of Larnaca. Prior to the trip, I had purchased Eugene Atget's Paris, and his influence is evident (to me at least). 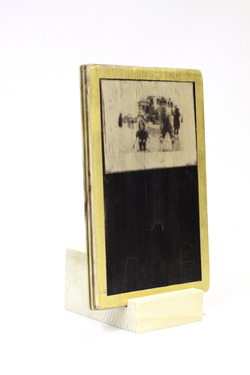 The wooden pieces, were my attempts to move photography away from traditional framing toward sculptural objects. Most are combinations of my own photography with that of purchased vernacular photography as a way to explore the loss of context associated with these anonymous images. The Cyanotype Landscapes are an ongoing project. They too are attempts at moving away from traditional framing methods. They are printed on large sheets of Asian paper, waxed for translucency, and hung exposed or hung in sort of box. When they are hung exposed, like in the photos, they have a wonderful kinetic aspect that responds to both viewers passing and presence, as well as the natural air currents of a room.